LOCATION.--Lat 42°05'33", long 75°54'53" referenced to North American Datum of 1983, Broome County, NY, Hydrologic Unit 02050101, on upstream side and about 100 ft from left end of Washington Street (pedestrian) bridge and about 500 ft upstream from Chenango River at Binghamton. PERIOD OF RECORD.--July 1901 to December 1912 (discharge record discredited), November 1987 to June 1990 (annual maximum only, published under station 01503495 at site 1.2 mi upstream), July 2009 to current year (gage height only). Once-daily gage-height readings for 1902-74 in the files of NOAA National Centers for Environmental Information, Asheville, N.C. GAGE.--Water-stage recorder. 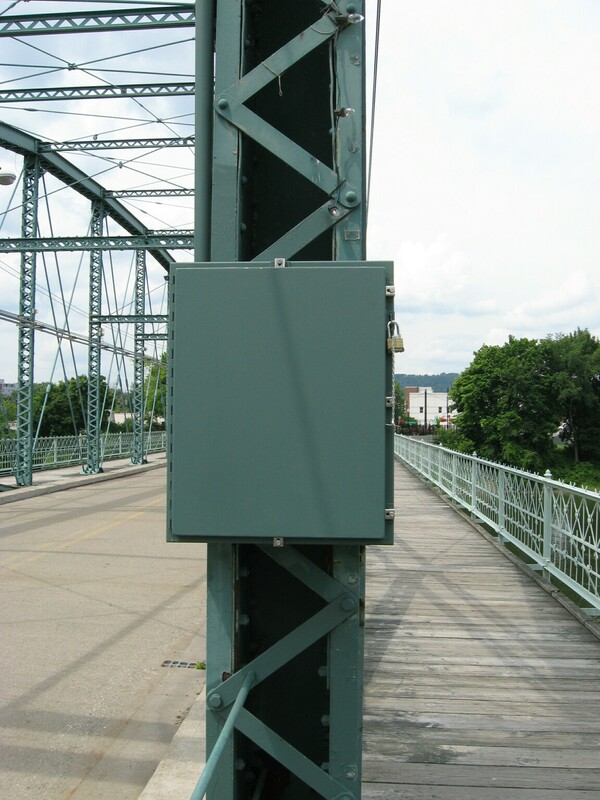 Datum of gage is 821.49 ft above NGVD of 1929 and 821.02 ft above NAVD of 1988 (VERTCON). From Nov. 1987 to June 1990, at site 1.2 mi upstream at different datum. REMARKS.--Minor regulation by upstream lakes and reservoirs. Gage height occasionally affected by backwater from Chenango River. The Binghamton concrete floodwall and earthen levee flood protection works were completed in 1943. EXTREMES FOR PERIOD OF RECORD.--Maximum gage height, 25.73 ft, outside gage height was 26.28 ft, from crest-stage gage, Sept. 8, 2011; minimum gage height, 1.79 ft, Sep. 28, 29, 2015. EXTREMES OUTSIDE PERIOD OF RECORD.--Flood of Mar. 17, 1865, reached a stage of 23.5 ft, from floodmark. Flood of Mar. 18, 1936, reached a stage of 22.9 ft, from National Weather Service. Flood of June 28, 2006, reached a stage of about 25.2 ft, from flood profile.